Once the plans were formalized on paper, I laid out the track plan on the floor full size using chalk, (Figure 1) and continued to fine tune the design as I went. At one point, the entire Indio yard was flopped and several grand designs on paper were abandoned once the reality of what would fit in real space became apparent. 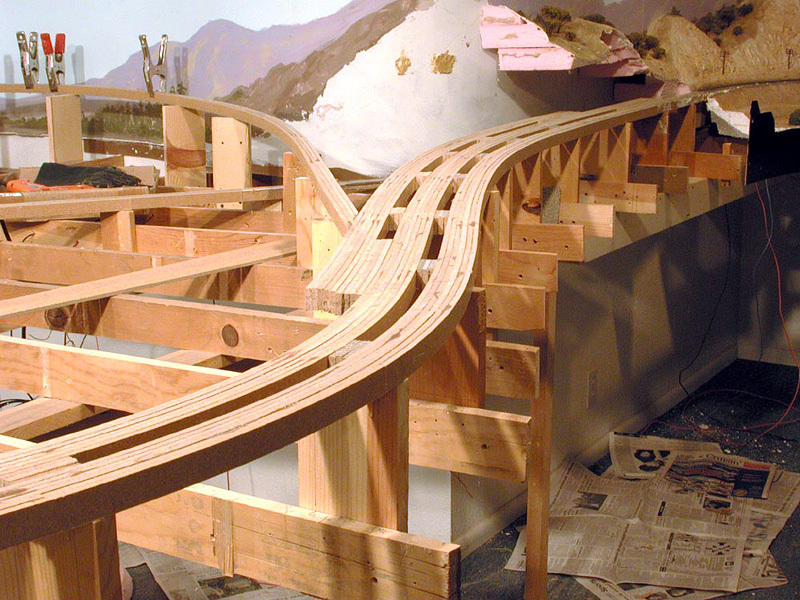 The roadbed was a combination of a plywood-homasote sandwich in yards and large flat areas, and spline everywhere else. The spline roadbed was built up using a technique developed by Lee Nicholas and Rod Loder using quarter-inch tempered masonite ripped into one-inch strips at a cabinet shop. Using a plumb, I located the exact center line of the track on each joist and set a riser with a C-clamp. A 10-penny finish nail was driven a short distance into the riser on the center line and the spline was clipped to it using a spring clamp. (Figure 3) After a half dozen or so risers were in place the single strip of spline began to take the shape of the track alignment. To this, hot glue was applied using an industrial "adhesive applicator" which could lay a bead of hot glue three feet long in one sweep. 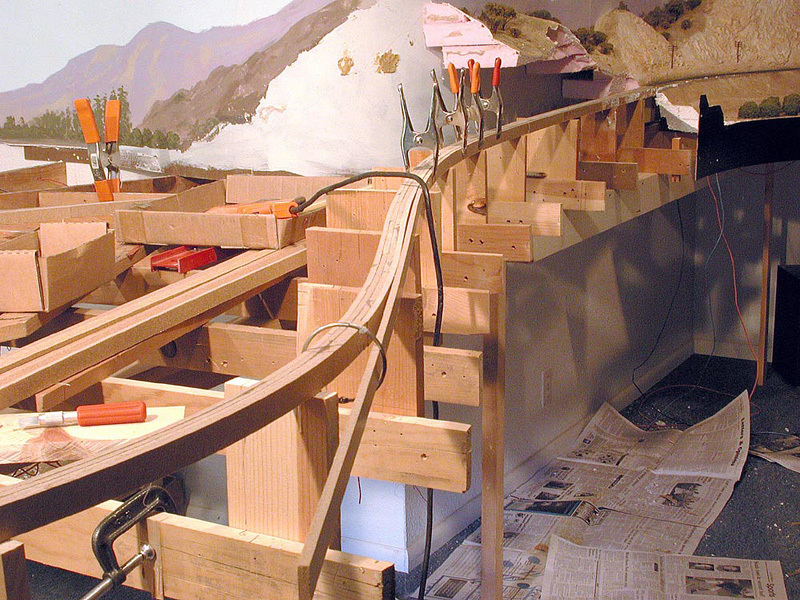 To this the next strip was applied and clamped every eight inches or so adjacent to the first. 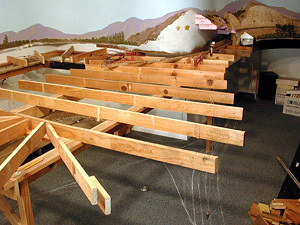 Overlapping one on another, the road bed was eventually built up to six strips -adequate for single track. (Figure 4) The spline naturally made its own transitions out of curves. 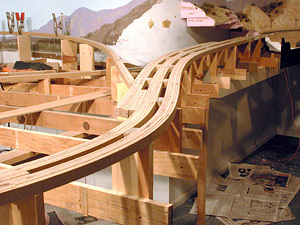 Double track was built up using spacers. 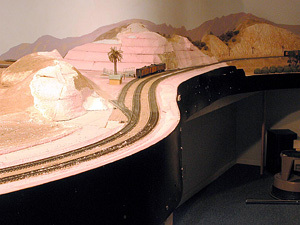 The entire railroad was laid with code 70, 83 and 100 flex track. 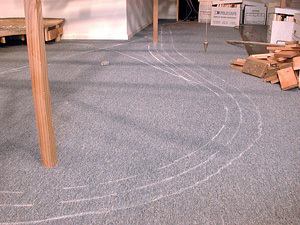 Foam panels were laid on top of spline and the contour traced with a pencil. Once cut, the foam was butted up against the spline and glued in place with hot glue. 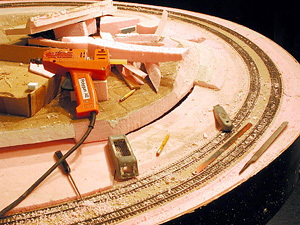 (Figure 5) The combination of hot glue and sheet rock screws made for extremely rapid construction. The pink foam, layered and sculpted with a rasp and saws (Figure 6) overlaid with plaster, soil and ground foam was a treat to work with. Bruce Petty created much of the plaster rock work. The orange trees were made out of styrofoam balls coated with glue and ground foam. The eucalyptus trees were made of twisted wire frames to which foam netting was applied, while the palm trees were acquired from AMSI and M-Tek. The scrub oak was modeled with dried Yarrow branches and foam netting. Many of the structures are scratch built, by myself, Pat Bray and Jay Mica, while some are from kits.